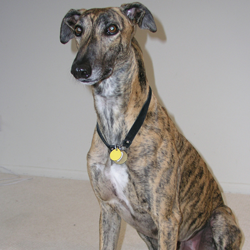 Greyhounds on the track are generally trained to not eliminate in their crates. This builds on a dog’s natural desire to avoid pooping and peeing where they eat and sleep. 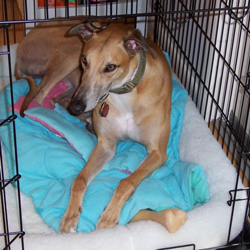 When the Greyhound retires to life in a home, he must learn that the entire house is, in effect, his crate or den. 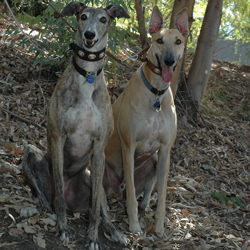 GreySave dogs are housetrained in their foster homes; however, adoptive families must follow through by letting dogs know that the same rules apply in adoptive homes as in foster homes. The first 72-96 hours are crucial. If you are consistent during this time, housetraining will usually be a breeze. If you fail during that time, you may be in for an extended time of effort. This does not mean that you must stop your life and stare at the dog 24 hours a day. Attach the dog’s leash to your belt and go about your normal business. This does two things: it helps the dog bond to you; and it helps you know exactly where the dog is and what it is doing at all times. An alternative is using a baby gate to confine the dog in the room with you (as long as you are not distracted and can see the dog at all times). At night or when you are gone for short periods, use a crate. An alternative at night is to block off a small area on one side of your bed. Place the dog’s bed next to yours. This allows you to hear if the dog needs to go during the night. Dogs are inherently neat animals. Given the choice, they will not soil their den; the same principle will apply to the crate or small area where they are sleeping. Once the dog grasps the idea of going out a doggie door or letting you know when he needs to go out, you can begin to slowly let your dog EARN access to larger areas of your home while you are there. Remember, if you do not spend time with the dog in a room, then that room does not qualify in the dog’s mind as part of “the den.” You may want to keep seldom-used rooms closed off. Once he is doing well while you are home, try leaving him out of his crate when you are gone. However, start with leaving him confined to one room, perhaps the kitchen. 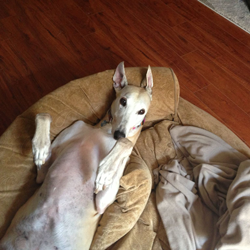 Your Greyhound is not a watchdog; your absence means nap time for him. There is no reason for your dog to have full run of the house when you are gone. Another way you can help your dog succeed is by proper cleaning of any mistakes that do happen. The smell of urine often encourages a dog to urinate, and a dog can smell one part of urine in 60 million parts of water. That's the equivalent of two tablespoons of urine in an Olympic sized swimming pool of water. To properly clean up any mistakes, first soak up as much liquid as possible. This is especially important on carpet to limit the amount of liquid seeping down into the carpet pad and below. Then wash the area with an enzyme-type cleanser especially made for urine odors. (Ordinary cleansers often don't work.) This will discourage the dog from using the area again. Age Considerations: Realize that puppies under six months and many senior dogs do not have the physical ability to "hold it" very long, if at all. You must provide opportunity for them to go to the bathroom in an approved spot at all times. Time Considerations: Regardless of age, don't expect your dog to "hold it" for more than five or six hours. Could you go to the bathroom before leaving for work and not go again until you return 9-10 hours later? In fact, forcing the dog to hold it too long can cause kidney or bladder infections and other health or sanitary problems. The discomfort can also contribute to separation anxiety. • a doggie door which opens to a secure portion of the yard or garage. 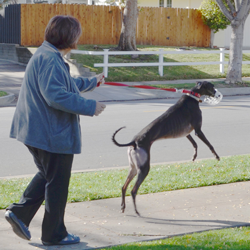 • a dog walker, friend, or neighbor to let the dog out during the day. • puppy pads, dog litter boxes, and many other new products on the market. One product even holds strips of sod in a low pan of water so the dog thinks he is going on grass. You simply replace the sod as needed. Leaving a dog in the garage or outdoors all day should not be an option. 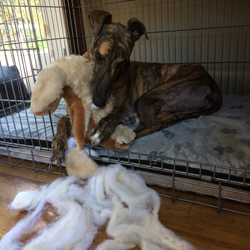 If you have a GreySave Greyhound, this is, in fact, prohibited by the contract you signed. Temperatures in a garage get too hot in the summer and too cold in the winter. If you don't believe it, try sitting out there without clothes on for even an hour some day in July or December. Your dog should always have access to a temperature-controlled area, even if it is only part of the house. The consistent training pattern you establish must include the following: accompanying the dog outside first thing in the morning, last thing at night, after eating, after playing, and whenever you see the dog circling, sniffing, or acting restless. 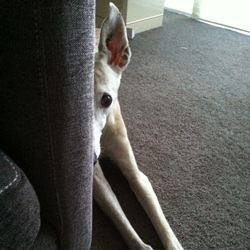 Many owners have found that Greyhounds are subtle with their requests to go out. They seldom will bark or dance frantically at the door to get your attention. More often, they will quietly pace or longingly stare at the door hoping that you will get the hint. NOTE: It is extremely important that you take the dog outside during the training stage. Do not simply turn the dog loose in the back yard and hope he or she goes. Go out with the dog so you can praise the dog profusely when he or she does what you want. You double (or even triple) the effectiveness of your training when you praise good behavior instead of simply correcting bad behavior. Some dogs, especially males, go to the bathroom "in stages." They will mark one spot, sniff, mark another spot, sniff, mark again, etc. (Remember to praise each time.) Bringing the dog in too soon will mean that he must go again before long. Let him take the time necessary to completely empty his bladder. To avoid confusion or distraction, do not let the event turn into an outdoor play period. Keep playtime separate from bathroom time. 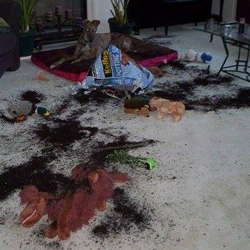 Unbreakable Housetraining Rule #1: Never, never correct a dog unless you catch him in the act. When you catch the dog in the act of having an accident indoors, clap your hands or shout “NO!” This should stop the momentary action. Then calmly rush the dog outdoors to finish. When your pet does go outside (or even tries to go), praise him profusely. Every time the task is completed praise him profusely! One exception is with shy or fearful dogs. If exuberant praise is frightening rather than enjoyable to your dog, make your praise calm but upbeat so that it is a positive experience for the dog. You may also use treats, but be sure to give the treat at the moment that the dog finishes going. Rewards or punishments relate to what is happening at that moment. Waiting until you go back inside rewards the dog for coming inside, not for going to the bathroom outside. REPEAT: Housetraining Rule #1: Never, never correct a dog unless you catch him in the act. While dogs may “act guilty” when you discover a housebreaking mistake, they are merely responding to your body language at the time. They cannot relate praise or correction to an activity that took place even a few seconds before. Remember, dogs associate rewards and corrections with the act that is currently taking place (i.e. your coming home, or your walking into the room). Correcting a dog when you come home to find a mess will lead to other, more difficult problems such as separation anxiety. You can never correct a dog for a behavior unless you catch it IN THE ACT. 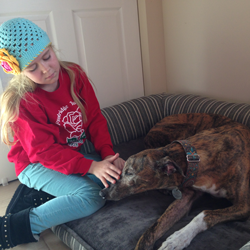 Housetraining Rule #2: Never rub the dog’s nose in a mistake. If you find a mess in the house, don’t rub the dog’s nose in it. This is ineffective for three reasons. • It encourages your dog to become sneaky. Your dog begins to associate going to the bathroom with your negative reaction. He or she becomes fearful of letting you know when it is time to go out and instead seeks out a hidden corner when you aren’t looking. • It confuses the dog. The dog needs to go to the bathroom. The mistake is not the act of eliminating, it is the place of eliminating. Taking the time to rub the dog’s nose in the mess hinders your ability, and the dog’s desire, to get outside so the dog can eliminate in the right place, be praised, and learn the correct place to meet its need to go to the bathroom. Take preventive steps to keep your frustration level low. Until your dog is trustworthy, always confine or directly supervise him or her. “When in doubt, take him out,” better too soon than too late. • Plan on making trips to the yard your top priority during the housetraining period. • Don’t hope your dog will “hold it” while you finish a chore or sleep late. • Don’t start in on housetraining and then drop it for a few days until it’s more convenient. There may be times when you feel like screaming–DON’T. Losing your temper will only make your dog frightened of you. Physical punishment and intimidation undermine training efforts. Effective training is accomplished through praise, positive reinforcement, and gentle reminders. Don’t give up because of indoor accidents after your attempts to housetrain. If you failed to catch mistakes when they happened those first few days, re-training can take several weeks of 100% consistency. Dogs who “can’t be housetrained” are dogs who probably weren’t given a consistent training routine--or a fair chance. Rule out a physical problem (see “Special Problems” below), and then go back to square one and step up your watchfulness to prevent future accidents. You may want to also consult a dog behaviorist to give you additional tips and help you analyze your specific situation. If you are having a serious problem housetraining your dog, please consult a veterinarian in order to rule out physical problems. For example, urinary tract infections or hormonal factors may cause even a previously housebroken dog to have accidents. It is imperative to consult a veterinarian if your dog strains to urinate, urinates unusually frequently, has blood in the urine, or leaves urine puddles where resting. Some dogs suffer from “submissive urination.” When excited or scolded, even mildly, they urinate on the spot. The cause of this response is psycho-logical, not physical. Any discipline or drawing the dog’s attention to the accident will likely make the condition worse. In these cases, accidents commonly happen when the dog is excited. Puppies will usually outgrow submissive urination by the age of six months. For older dogs, patience on your part and giving the dog a strong sense of security within your family will usually cure this problem. If not, consult a behaviorist who can outline the best approach to curing your dog of submissive urination.